The Formula Series is DXRacer's answer to those seeking affordable luxury. These chairs are well-known to eSports players and their fans. We are featured by popular eSports teams such as compLexity, Dignitas, and Fnatic, and are represented at big events such as UMG and WCG. The Formula Series' high-density cold cure foam filling makes these chairs comfortable for extended use, especially for durations of 8 hours and longer. With a tubular steel frame and a metal star base, as well as comfortable armrests, the Formula Series offers superb stability. High backrest. Most office chairs have a low back making it impossible to rest your neck. DXRacer has overcome this problem successfully with its range of high back office and gaming chairs. 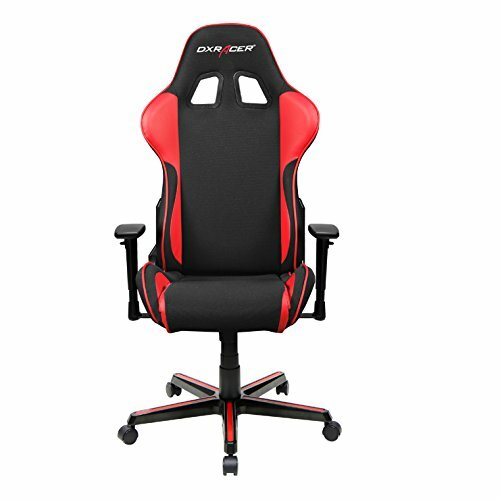 In addition, the DXRacer seat can be lowered degrees, to a comfortable position for power napping during long overtime sessions at night, due to its angle adjuster. you're sure to be comfortable. Maximum Seat Height : 21"
Minimum Seat Height : 16.5"
Maximum Arm Height : 29"
Minimum Arm Height : 22"
Backrest Shoulder Width : 22.25"
If you have any questions about this product by DX Racer, contact us by completing and submitting the form below. If you are looking for a specif part number, please include it with your message.